M T D O c t o b e r 2 0 1 8 20 ©GETT YIMAGES.COM/BUBAONE COURTESY OF SAMSON MOTORS INC. 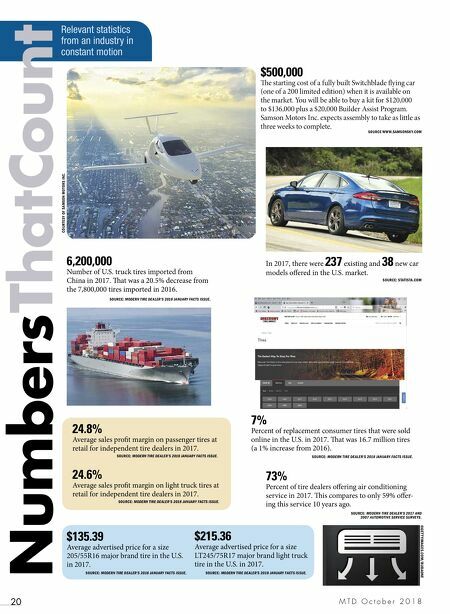 SOURCE WWW.SAMSONSKY.COM Relevant statistics from an industry in constant motion NumbersThatCount SOURCE: MODERN TIRE DEALER'S 2018 JANUARY FACTS ISSUE. 6,200,000 Number of U.S. truck tires imported from China in 2017. at was a 20.5% decrease from the 7,800,000 tires imported in 2016. 7% Percent of replacement consumer tires that were sold online in the U.S. in 2017. at was 16.7 million tires (a 1% increase from 2016). $215.36 Average advertised price for a size LT245/75R17 major brand light truck tire in the U.S. in 2017. 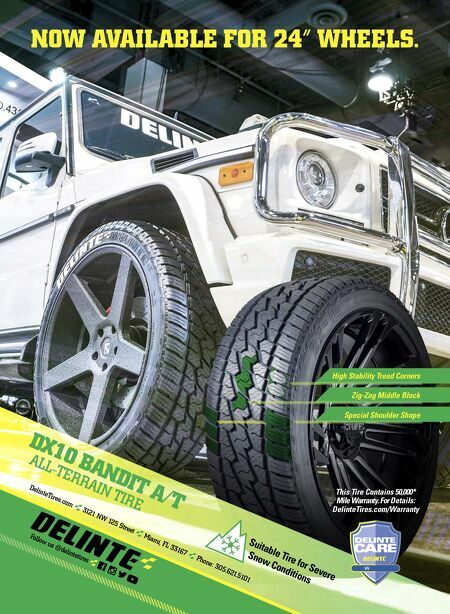 $135.39 Average advertised price for a size 205/55R16 major brand tire in the U.S. in 2017. $500,000 e starting cost of a fully built Switchblade flying car (one of a 200 limited edition) when it is available on the market. You will be able to buy a kit for $120,000 to $136,000 plus a $20,000 Builder Assist Program. Samson Motors Inc. expects assembly to take as little as three weeks to complete. In 2017, there were 237 existing and 38 new car models offered in the U.S. market. SOURCE: STATISTA.COM SOURCE: MODERN TIRE DEALER'S 2018 JANUARY FACTS ISSUE. SOURCE: MODERN TIRE DEALER'S 2018 JANUARY FACTS ISSUE. SOURCE: MODERN TIRE DEALER'S 2018 JANUARY FACTS ISSUE. 24.8% Average sales profit margin on passenger tires at retail for independent tire dealers in 2017. SOURCE: MODERN TIRE DEALER'S 2018 JANUARY FACTS ISSUE. 24.6% Average sales profit margin on light truck tires at retail for independent tire dealers in 2017. SOURCE: MODERN TIRE DEALER'S 2018 JANUARY FACTS ISSUE. 73% Percent of tire dealers offering air conditioning service in 2017. is compares to only 59% offer- ing this service 10 years ago. SOURCE: MODERN TIRE DEALER'S 2017 AND 2007 AUTOMOTIVE SERVICE SURVEYS.